Following the Postimpressionism theme I decided that it is high time I posted something about Vuillard. You can find a short clarification who he was and you can browse some of his paintings as well. But upon starting I will tell you what particularly makes me interested in this painter. In a time when the development of avante-garde took place in Europe, Vuillard remained quite conservative, which, in a sense, makes him unique in the face of new trends. Jean-Édouard Vuillard (11 November 1868 – 21 June 1940) was a French painter and printmaker associated with the Nabis (a group of Post-Impressionist avant-garde artists who set the pace for fine arts and graphic arts in France in the 1890s). Jean-Édouard Vuillard, the son of a retired captain, spent his youth at Cuiseaux (Saône-et-Loire); in 1878 his family moved to Paris in modest circumstances. After his father’s death in 1884, Vuillard received a scholarship to continue his education. 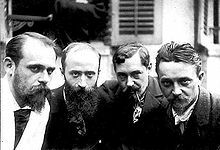 In the Lycée Condorcet Vuillard met Ker Xavier Roussel (also a future painter and Vuillard’s future brother in law), Maurice Denis, musician Pierre Hermant, writer Pierre Véber, and Lugné-Poe. In 1885, Vuillard left the Lycée Condorcet. On the advice of his closest friend, Roussel, he refused a military career and joined Roussel at the studio of painter Diogène Maillart. There, Roussel and Vuillard received the rudiments of artistic training. In 1887, after three unsuccessful attempts, Vuillard passed the entrance examination for the École des Beaux-Arts. Vuillard kept a private journal from 1888–1905 and later from 1907 to 1940. Image | This entry was posted in Art. Bookmark the permalink.